Call us for all of your soffit and fascia installation and replacement needs. Experience our outstanding craftsmanship and customer service. 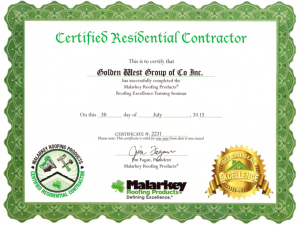 Golden West Exteriors are Malarkey Certified roofers. The mission of the Certified Residential Contractor Program is to provide a “shared value” concept bringing together industry roofing application details coupled with factory trained applicators using high quality Malarkey Roofing Products®. We provide the highest quality home renovation solutions of all Edmonton Roofing Companies. Call us today to book a Certified Roofing Contractor. Windsor® is a heavyweight designer shingle fortified with Malarkey’s unique Flexor™ SBS polymer modified asphalt technology to promote extreme weather protection. This product includes the Scotchgard™ Algae Resistant Shingle Protector from 3M for added security against algae staining. The Legacy®, Northwest-XL™, and the Highlander® are laminate shingles designed to give a dimensional appearance on the roof. These product lines include optional levels of added security against algae staining. Legacy® is a laminate shingle line fortified with Malarkey’s unique Flexor™ SBS polymer modified asphalt technology to promote extreme weather protection.